Known as "the god of the ugly things" by the Māori, New Zealand's giant wētā have remained almost unchanged from their ancestors of 190 million years ago, and are more primitive than the tuatara. There are now about 100 species of wētā, divided into five main groups - giant, tree, cave, tusked, and ground. 16 of these species are at risk. The largest of the giant wētā, which can grow up to 82 mm long, is found on Little Barrier Island in the Hauraki Gulf. One pregnant giant wētā female weighed 71 grams, bigger than a song thrush. It manages to survive alongside the kiore, or Polynesian rat, because it spends most of its time in the treetops, eating the green leaves of trees and shrubs, and also because of its large size. Planning is underway to start a new population of the Little Barrier Island on the "open" sanctuary of Tiritiri Mahangi in the Hauraki Gulf so that people can see them more easily. Another giant wētā, the Mahoenui, was thought to be extinct until a small colony was found in a patch of gorse in the King Country in 1962. Its numbers are now increasing with the establishment of a new population on Mahurangi Island, off the Coromandel coast. The scree wētā is the most common of the giant wētā, and is found in mountainous areas of the South Island. 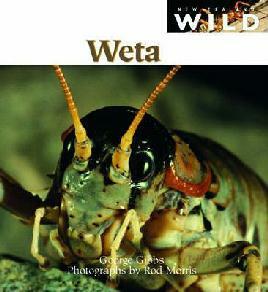 Giant wētā can be found in different places, in trees or on the ground under rocks or plants. They are nocturnal and hide for protection during the day. Wētā have large heads and small moths with strong jaws. Their antennae are twice as long as their bodies. Wētā can look fierce, and when threatened they will throw their hind legs up in the air. They bite only when directly under threat. After selecting a mate and sharing his territory for about six months, the female lays 100-300 eggs. The eggs will hatch from one to four months later, depending on conditions, as the soil around the eggs needs to be warm and damp. Wētā mature at about eighteen months, but will live for only two years. Like other insects, as the wētā grows it sheds its hard outer layer, or exoskeleton. When moulting like this, it becomes vulnerable to predators such as lizards, tuatara and moreporks. Because the giant wētā is slow and too heavy to jump, they are easy prey for introduced predators such as cats, rats, ferrets, stoats and hedgehog. In places the vegetation the giant wētā live in has been destroyed by humans clearing land, and by introduced browsing animals. However wētā are able to adapt to a modified habitat, and can survive in a much smaller area than other endangered or threatened animals. They can also be breed successfully in captivity, which gives better opportunities for research into their lives.